When given a literary analysis essay, your task is to provide some textual analysis by examining and evaluating types of literature such as a short story or poem. Much like virtually all types of analysis, this means breaking down the subject into individual components. It can be hard work, especially if the literature is not particularly interesting to you. But ultimately, an analysis paper or ap lit essay is intended to help you develop a deeper appreciation and understanding about literature. For example, consider poem analysis. Poetry analysis might involve exploring the images that the poem describes or even the relationship between the form and content of the piece. As another example, if you were tasked with analyzing a play, it might involve something like a character essay in which you look at the way in which the flaws of a tragic hero are hinted at through his actions during the course of the story. When doing literary analysis of a short story in the form of a theme essay, focus on exploring the themes (such as the challenges associated with moving away from home for the first time and adjusting to college life) and demonstrating how the author expresses that theme through the point of view of the character. Likewise, you could discuss how the character's difficulties are addressed through their dialogue or behaviors. Keep in mind that proper critical writing, such as a literary research paper, entails a sharp focus on thought and study. As you acquire experience with writing critical analysis paper assignments and familiarize yourself with different types of style in literature, you will suddenly be able to see writing in a whole new light. For instance, you will be able to understand what precisely makes an author's work so effective. Likewise, you will be able to critique the work and find flaws that might not be immediately obvious to the individual who is reading the text at face value. Of course, whenever you tackle critical analysis of literature, you want to stay focused (which means creating a thesis statement that unifies your paper) and support your ideas with evidence. This will be discussed in further detail below. As you start thinking about your critical analysis essay or analytical essay, it is important to develop a thesis statement. This can be thought of as the glue that keeps the entire paper together. Your thesis will be an argument that you intend to support with strong evidence from the literature (or if you are watching a movie, film analysis) and is usually in the last sentence of your introduction paragraph. Keep it understandable, concise and highly focused. If you try to cram too much into your thesis your paper is not going to make any sense. Likewise, if you make a broad, generic statement, it will be impossible to provide deep analysis. The introduction itself should hook the reader and give them a reason to continue reading. After all, you want to start things off with a good impression. For example, a critical response essay could start off with a quote from an authoritative figure, ask an intriguing question, tell a quick story, or bring up some surprising statistics. Depending on your intended audience, you might also need to provide some background information or context so that they understand the importance of the text or film being examined. Of course, you also need to mention the title of the literature or other medium as well as the author or director. This might seem like obviously advice, but you would be surprised to learn that a lot of students (especially those who lack experience with essay writing) take it for granted that the reader already knows the book and author and will neglect to include these details. In the vast majority of cases, your introduction should be limited to one paragraph. The body of the paper (generally 3 paragraphs) is used to expand upon the main points brought up in the introduction and should link back to your thesis statement. Each paragraph should focus on one of the main points. Note that the length of the paper varies, but if you are a college freshman, you will typically not be expected to write more than a one-page essay that covers the intro, body and conclusion. But there are some situations in which you might be asked to write a 500-word essay or even 750-word essay. As you support your evidence, feel free to use direct quotes, discuss specific details, or summarize important plot elements. The conclusion (which should also be one paragraph long) should be used to wrap up your paper in a tidy, thoughtful way. Use this opportunity to reiterate your thesis (but phrasing it in a different way), summarizing your main points, and discuss the broader implications of your findings. Of course, remember that the conclusion is not a place where you should be introducing new information, although you can hint that based on what you have written, there is much more that can be explored. While a lot of students come up with a title before they start writing their paper, it might not be a bad idea to wait until you've finished it. Indeed, once you have finished your paper, you can go back and think of an appropriate title that really identifies what you wrote. It should be brief but still descriptive and interesting. Do not simply call it "A Critical Analysis of Romeo and Juliet" as that is too general. Instead, narrow it down and include the particular theme that you are going to explore, such love. Thus, you could title it, "How Love Can Spark Tragedy: A Critical Analysis of Romeo and Juliet." Also think about the audience who will be reading your essay. While it is true that your professor might be the only person who actually reads it, you should also imagine that the essay is being written for your classmates since they will likely have been assigned the same text to evaluate. If you want the paper to be effective and stick out from the rest, you have to examine it from a different perspective; angles that your classmates might not have considered. Do not simply retell the story, find a way to explain or interpret the work at a deep level. Draw some interesting and intriguing conclusions and develop solid arguments. Finally, it is important to make a distinction between mere summary vs analysis. 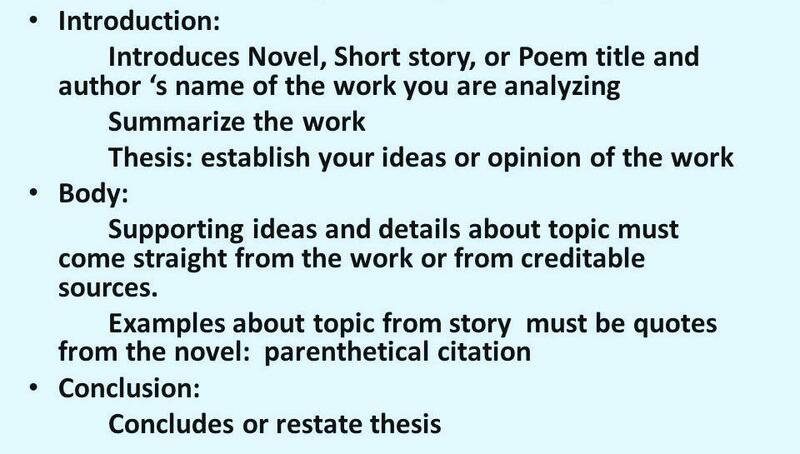 While summarizing the most important points is necessary if you want to provide some context (assuming the reader is unfamiliar with the literary essay work or film), a paper that consists entirely of a summary is not the purpose of an analysis paper. Using direct quotes. Quotations can really help you make a compelling case. Of course, if you are going to quote, you will need to explain why the reader should find it relevant. When using brief quotes, limit it to around four lines or less. For lengthy quotes, separate it from the text of your paper and do not use quotation marks at all. If using more than four lines, make sure to double space and indent ten spaces from the left margin, while keeping the right margin formatted as it is with the rest of the essay. Paraphrase. You do not want to overdo it on the quotes. In fact, even if you properly cite your quotations, professors will ask you to limit direct quotes to a certain percentage of your paper as a way to discourage students from adding loads of text with quotations merely to fill up space. But there are ways to get around this and paraphrasing is perhaps the best solution. Paraphrasing involves using material from other sources (still properly cited, of course) but rewriting them using different words. This can be effective in demonstrating that you understand what the text means since you are able to express it in a different way. Use specific detail. Instead of speaking in broad generalities about a character's personality (i.e., stating that they are extremely flawed but not explaining how this is the case), identify specific behaviors or incidences within the text in order to make a compelling case.